Would You Buy This Smart Beta Strategy? Smart beta investing strategies are on a roll. As one of the fastest growing exchange-traded fund (ETF) categories, there are now nearly 700 available in the market. With the number of smart beta ETFs increasing every year, their surging popularity is grabbing investor attention as the approach becomes a useful part of an investor’s toolkit. In this environment, it is important for investors to have a grasp of smart beta and its fundamentals—but unfortunately, smart beta is difficult to pin down. The category definition can be overly general and sometimes confusing, and few commonalities exist among the many strategies. To better highlight the challenges investors may face when selecting a smart beta strategy, it may be helpful to look at an example of a mystery smart beta strategy. The above chart illustrates the performance of a mystery smart beta strategy. This rules-based strategy for selecting stocks from within the S&P 500 Index has been a big winner over the current bull market. Despite suffering from a meaningful drawdown during the Global Financial Crisis, the strategy has been a huge outperformer in the subsequent recovery. Accounting for the full timeframe, the strategy has outperformed the index by over 100% since the end of 2006. Given it’s rousing success, one would expect this strategy to be enjoying robust inflows and wide publicity. 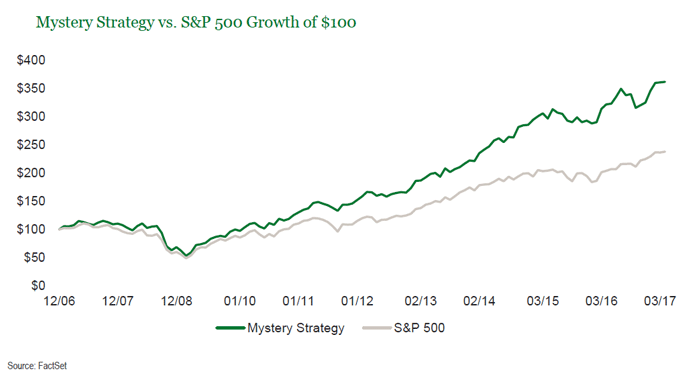 What is this mystery strategy that has been so effective in the current market environment? The mystery strategy is to invest in S&P 500 companies headquartered in the state of Indiana. 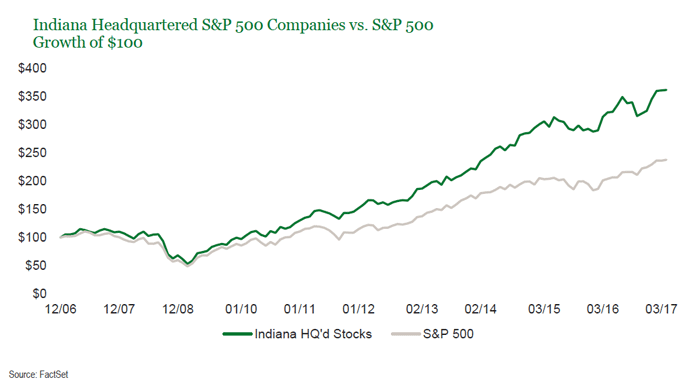 While we have no issue with the state of Indiana—surely it is home to a number of successful enterprises—there is little fundamental reason to explain why Indiana headquartered companies would have outperformed and should continue to outperform so significantly in the future. As is the case with our mystery strategy, the performance of a smart beta strategy is a poor indicator of its validity on its own. To help investors better identify the key fundamental charateristics of a smart beta strategy, there are several questions investors should ask when considering an allocation. 1. What role would the strategy play in my portfolio? Investors should first be able to identify the intended objective. To then determine what smart beta strategy may meet that objective, focus on strategies with a rationale that is logical and sound. It should be clear why the exposures generated are desirable for achieving the objective. 2. 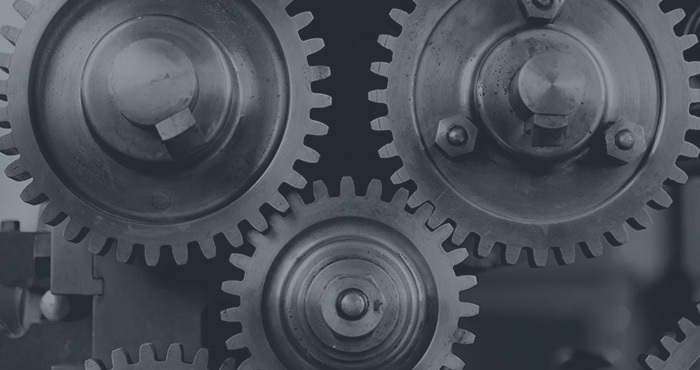 What are the investment thesis and underlying research behind the strategy? Depending on the strategic goal, some smart beta strategies may have a rationale that generates exposures for reasons that appear unclear. These smart beta strategies should be defendable by robust research. Look to see if the firm behind the strategy can show evidence that the methodology has worked in the past and if the methodology can be reasonably expected to work in the future. 3. When will I win and when will I lose? Investors should be aware that performance outcomes from certain strategies and exposures can differ depending on the market backdrop. These differing outcomes are due to the distinct characteristics that define each market environment. Because of this, both asset managers and investors need a sensible set of expectations for how a strategy should perform before making an investment decision. Many of these questions reflect common concerns investors also have when considering an allocation to a traditional active management approach. Each investment approach is rightfully a useful tool for investors to consider in meeting certain needs of a portfolio.